The 12-year-old Rio girl that created the viral social media campaign to promote Scott’s Law and help protect emergency personnel was recognized this week at the Illinois State House. Lucy Kuelper created the Move Over Project on Friday, March 29th, as a way to help keep or dad, State Trooper John Kuelper, safe while on the job. The viral campaign has garnered almost 19,000 likes on Facebook since the page was made two weeks ago. 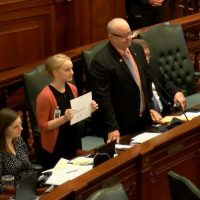 Lucy appeared at the Illinois capital this week where she and her parents were recognized on the House Floor by Alpha Representative Dan Swanson. Lucy has been featured on papers, television, and radio in Chicago and throughout the state.